Goshen Theater as part of Goshen First Friday and Goshen College Homecoming Weekend. The performance was spread over two extended sets starting at 6 p.m. and 8 p.m. respectively. Lavender Jazz is an ensemble consisting of students from GC with a variety of majors. instrumentalist who earned a master’s in music from the Juilliard School in New York City. In addition to these roles, French teaches music at Holy Cross College and Indiana University South Bend. This year’s ensemble includes Lukas Thompson, a junior, and Reid Wegrecki, a senior, on vocals. Wegrecki also plays French horn. Riley Friesner and Hans Miller, both juniors, as well as Joe Harshbarger, a first-year, are on saxophone. Chloe Holmes and Greg Smucker, who are not students, play trumpet. Trombone is played by Issac Godshalk, a senior. Julian Harnish, a senior, and Gabe Miller, a sophomore, are on piano. The guitarist is Simon Hurst, a first-year. Bass is played by Nate Berkey and drums are played by Tyrus Tucker. The two performances consisted of selections from the genres of swing, ballads, bossa nova, waltz and beguines. 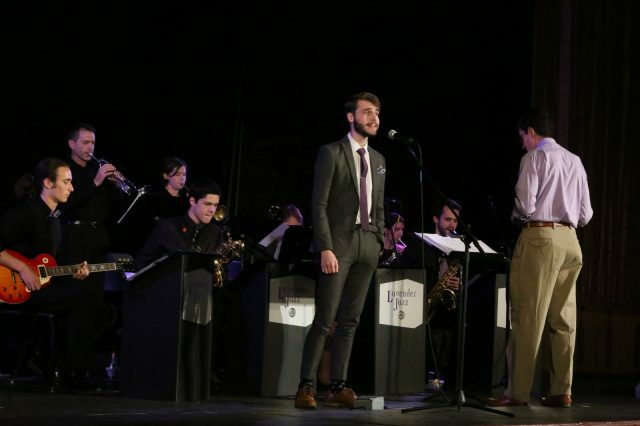 With Thompson on vocals, the ensemble also performed “Minnie the Moocher,” a piece made famous by jazz legend Cab Calloway, as arranged by Wegrecki. “Although I didn’t have a lot of past experience with the song, it was a lot of fun to get up there and sing ‘Minnie the Moocher’ with a bunch of great musicians,” Thompson said. The program also included a combo section consisting of Godshalk, Hans Miller, Wegrecki, Hurst, Berkey, and Tucker with Gabe Miller on vibes.